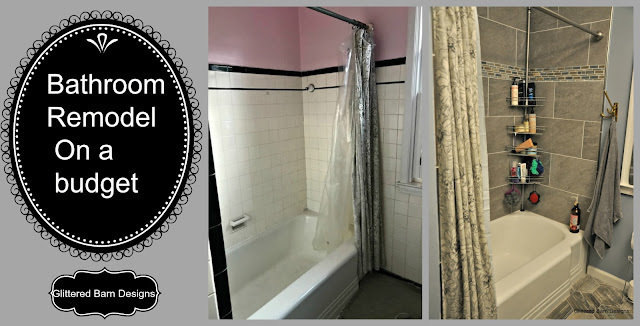 After about three weeks, the bathroom is finally done! Let me just say this was a labor of love and a test on my patience, because I really have none (patience that is ...). We were stuck taking showers at either the gym or friend's houses, and as you can imagine, that was not fun. Especially when I like to take more then one shower a day sometimes. I would work on stuff in the house and then be all hot, tired and sweaty with no way to take a shower. I contracted some of the work out, and did some of it myself. Mr. Muscles was a great help, he did most of the heavy lifting. Let me remind you of what the bathroom looked like before. It was outdated and gross right? Now you know why I am so pleased to present my updated, vintage chic bathroom on a budget! It's a big improvement right?! 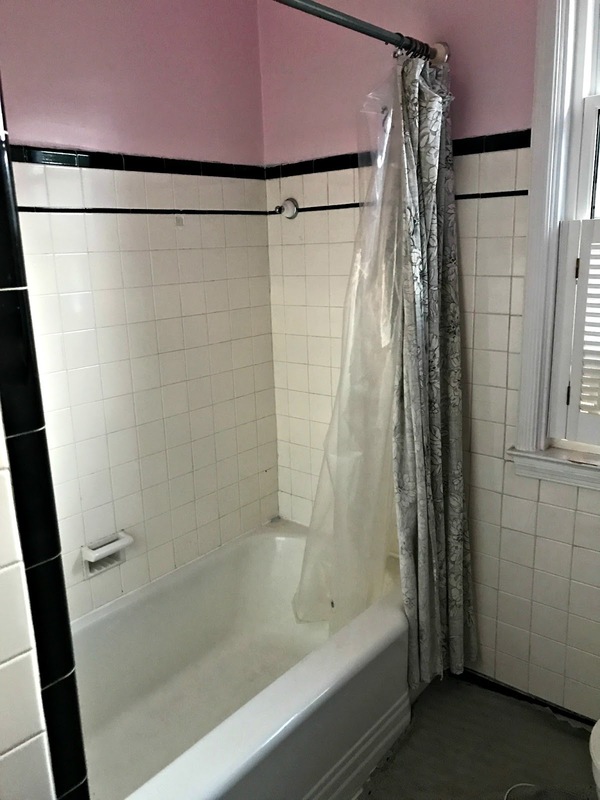 The tile in the shower was updated from the broken black and white vintage tile that was there before. 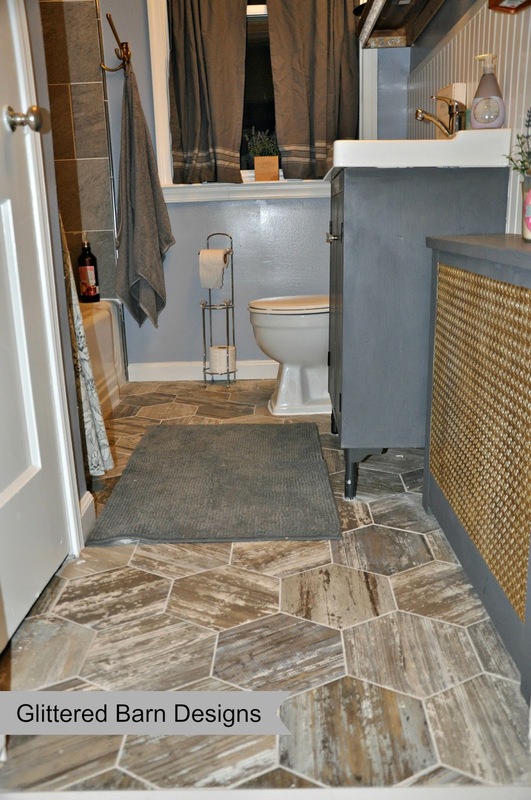 It was replaced with 1' x 2' gray tile I got from the Habitat For Humanity Resale store for a total of $87. 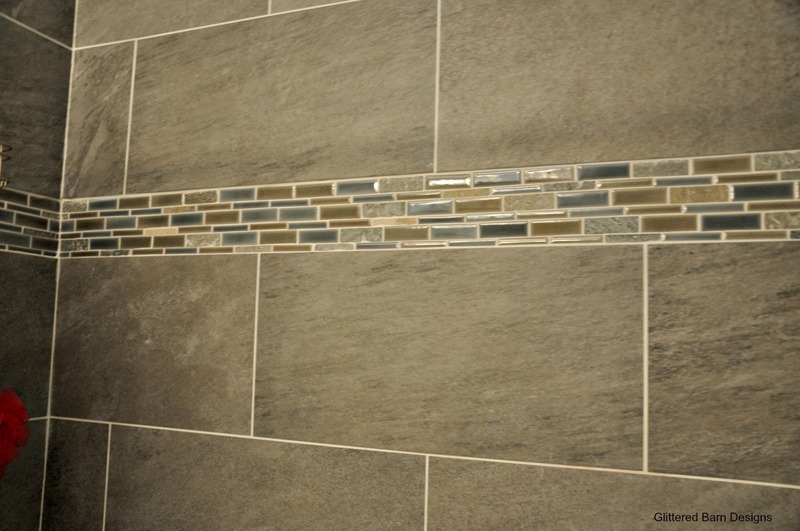 I broke it up with some pretty mosaic tile from Home Depot that cost me $54. I also had to buy the end tile, which was about $120. You cannot really tell from the picture, but there are flecks of glitter in the tile. It feels so good to take a shower in her. Here is a close up of the tile detail. I saved money by buying the bulk of the tile at the resale store and adding a decorative accent tile. I only needed 6 sheets of the mosaic tiles, so I ended up spending $261 for the tile in the bathtub. The floor is one of my many favorite parts of the remodel. I paid $147 for the tile at a local tile store in MD. It has a very pretty vintage effect and has an interesting shape. 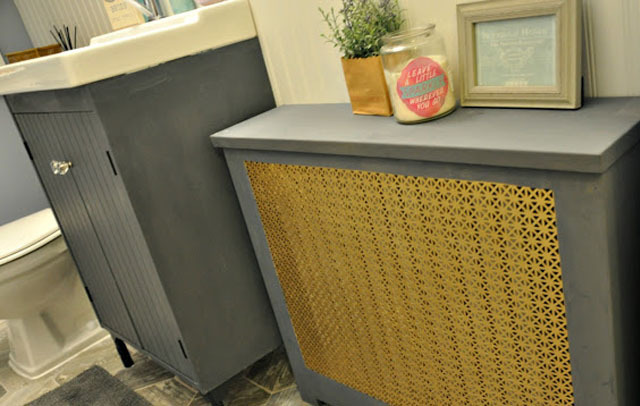 I kept the same radiator cover, I just spray painted the grate gold and painted the rest in Amy Howard paint. The color is called "A Good Man Is Hard To Find". I thought that was a fun color to paint it. The bathroom vanity is something I am really proud of too. I have a small bathroom and I was having trouble finding a vanity that was small enough to fit and wasn't made of pressed fiberglass or particle board. I found this one at IKEA called Silveran/Tälleviken, and it was $199. 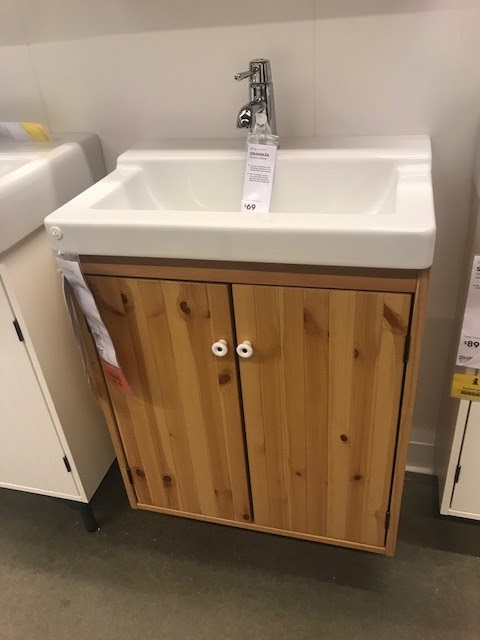 I think this sink has a lot of possibilities. All the sinks I saw at home improvement stores were at least $225, and they were UGLY. But with a can of paint and some new knobs, this one turned out very cute! 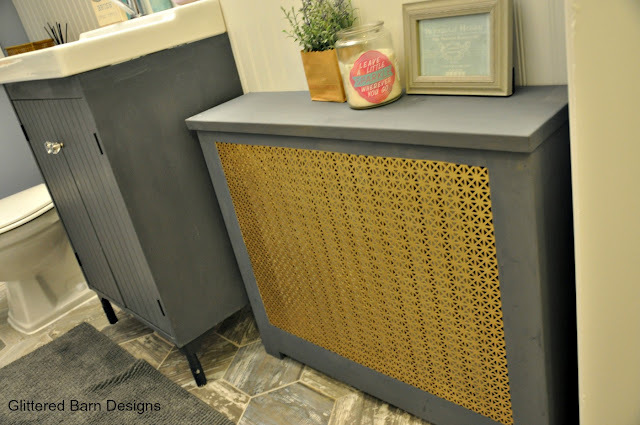 I love how just a can of paint and knobs can give this a whole new look. 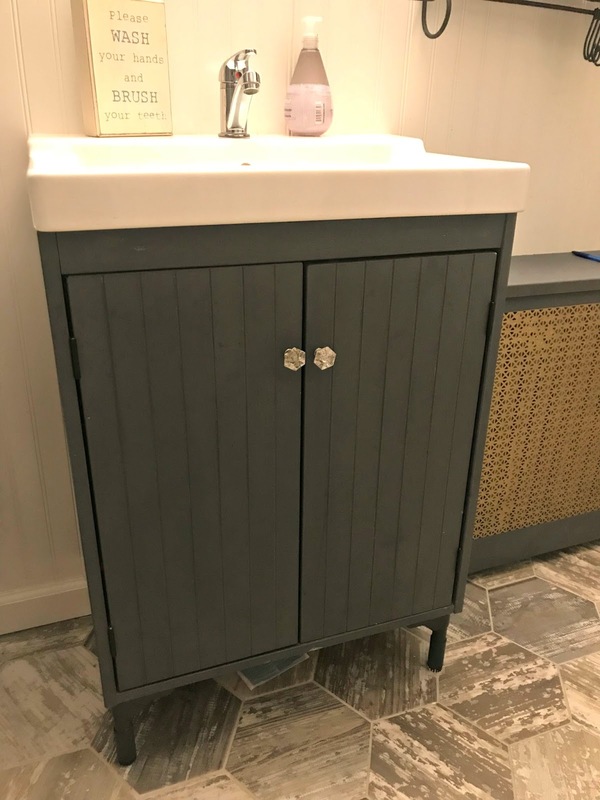 This cabinet from IKEA has a lot of versatility, you could paint it so many different colors. You could paint it white and distress it for a shabby chic look, or you could paint it high gloss black for a more modern look. 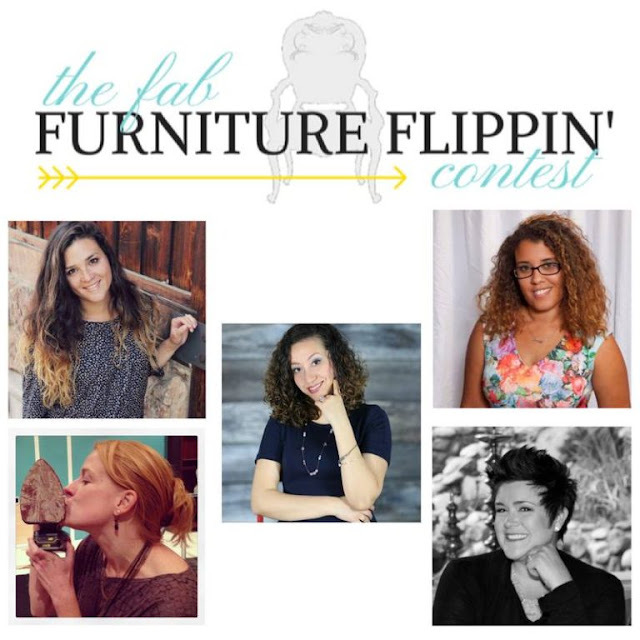 It can be customized to fit many different styles, and is an inexpensive way to add style. 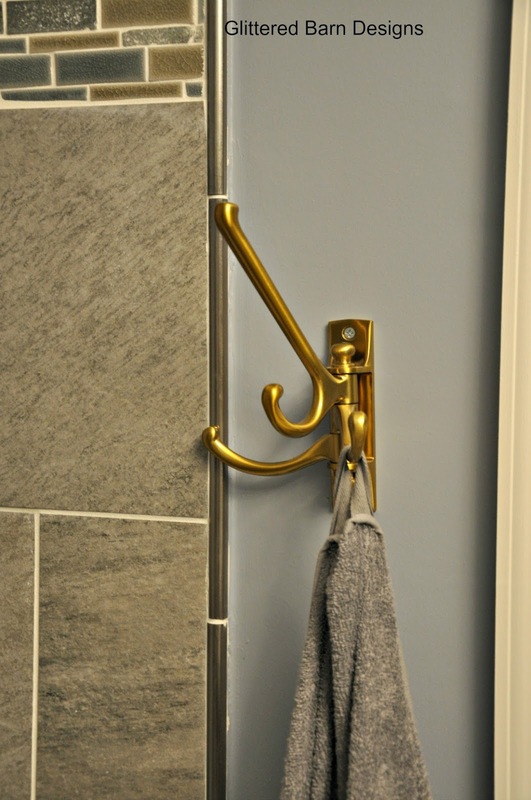 I also got this gem from IKEA for $9.99 to use as towel holder. 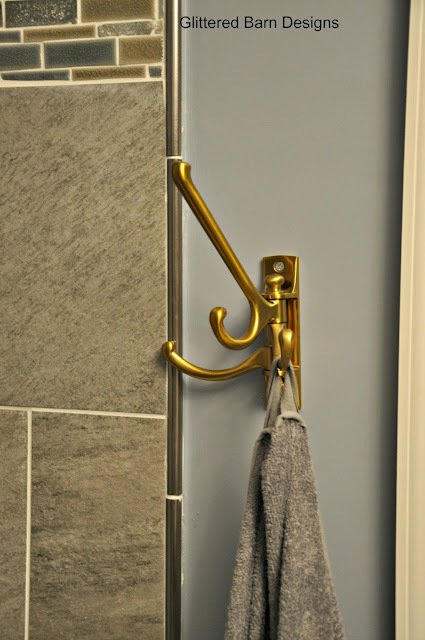 I bought all new towels from IKEA for $2.99 each and they had this handy hook on them to make it easier for my kids to hang their towels up. If you don't want to buy all new towels or you don't live near an IKEA then you can sew ribbon onto your towels and get the same result. 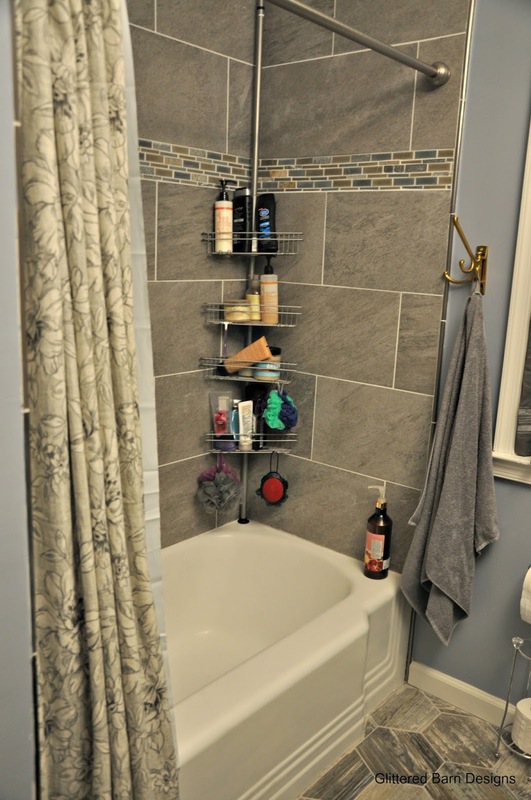 The bathroom is pretty much done except for a few finishing touches that I want to add. I will also share a post on the closet I made over too. Visit ArchitectureForLondon.com to know about the factors affecting extension cost London, as it will help you to plan the finances before starting your home remodelling work in a hassle free manner. 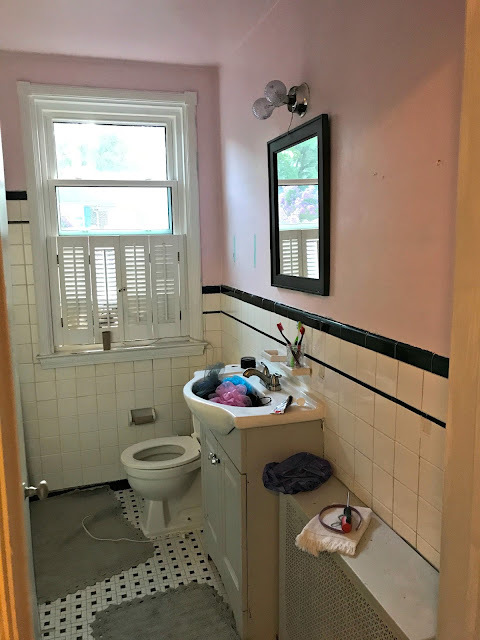 The benefits of bathroom renovation have a wide range whether you are remaining there for the whole deal or hoping to offer sooner rather than later. 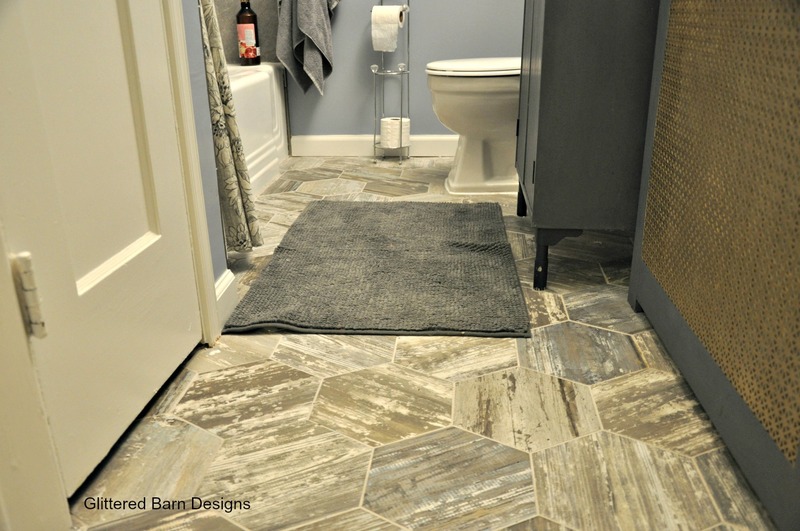 Tile Giant Coupon Codes | Tile Magic Coupon Codes is definitely the best choice to consider during home renovation. The interior designs you have shared here is really superbb. Just looking fab. Keep posting more like this. It feels nice to see how easily my son helped me to provide a facelift to all bathrooms by adding new taps and showers cost-effectively.